Scarce Water --- Currently, 434 million people face either water stress or scarcity. Depending on future rates of population growth, between 2.6 billion and 3.1 billion people may be living in either water-scarce or water-stressed conditions by 2025. Scarce Cropland ---The number of people living in countries where cultivated land is critically scarce is projected to increase to between 600 million and 986 million in 2025. Fisheries --- Most of the world 's ocean fisheries are already being fished to their maximum capacities or are in decline. Forests --- Today over 1.8 billion people live in 36 countries with less than 0.1 hectare of forested land per capita, an indicator of critically low levels of forest cover. Based on the medium population projection and current deforestation trends, by 2025 the number of people living in forest-scarce countries could nearly double to 3 billion. October 31,2011-The world's seventh billion person was "officially" born today - but according to some experts, the UN might have jumped the gun. The US Census Bureau says the most likely date the world population will reach seven billion is between March and April next year. There is a window of uncertainty of at least six months before and six months after the 31 October for the world population to reach seven billion. According to the UN's population website, no-one can determine the date with an error margin smaller than about 12 months, as even the best censuses have "inevitable inaccuracies". 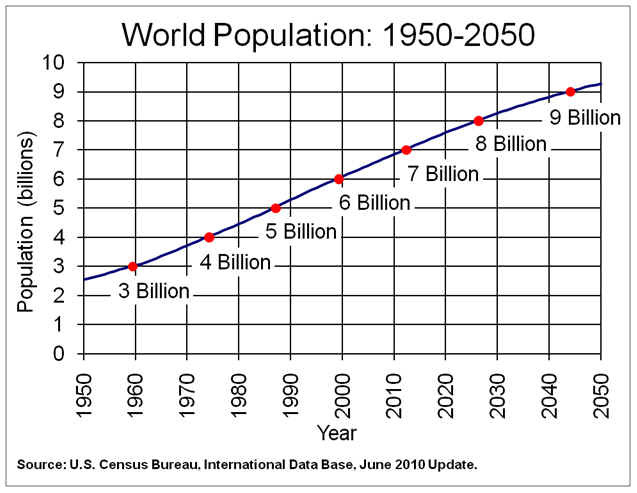 The UN's reason for naming a symbolic date as seven-billion day is to draw attention to the speed of population growth, with less than 13 years having passed between the six-billion and seven-billion milestones. 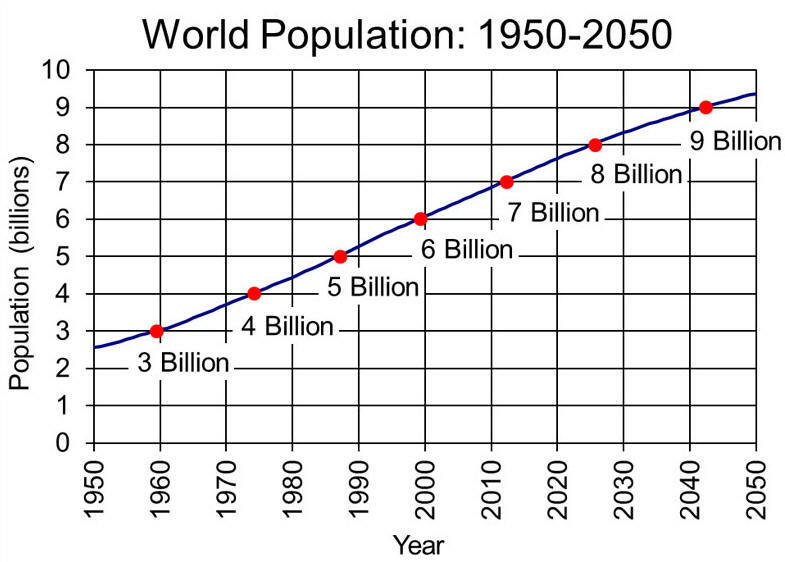 Since 1968, the population of our world has doubled. However, despite major declines in the average number of children per women, population growth is projected to continue at least until the middle of the 21st century. Nearly all of this population growth will occur in less developed countries, in countries that already face major difficulties meeting the basic needs of their citizens. About two billion people, a third of the world's population, lack access to modern energy sources, including electricity or even fossil fuels. They rely on firewood or biomass -- crop residues or animal dung -- for cooking, heating and lighting. About 2.5 million women and children die every year from respiratory diseases caused by primitive cooking stoves. Many people in developing nations, especially women, spend long hours searching for firewood, reducing their chances of education and development. As the population swells, rising demand for firewood leads to deforestation. There may be anywhere between 168 and 257 nations, depending on who is doing the counting. There are approximately 170 separate currencies, 239 two-letter country codes recognized by the ISO (International Standards Org. ), and the Universal Postal Union has listings for 500,000 localities in 189 Countries.